PAGE (20) FIRST ANIVERSARY ISSUE FANTASY NEWS --------------------------------------------------------------- ter has developed a personality of its own. Of course when that happens one is reminded of the famous Club Locales of ficition that have a personality, such as the Explorers' Club, the Strangers' Club, the Scientists Club etc. That is the essence of good comradeship --- a group personality that works harmoniously and reaches agreements with a minimum of argument and a total lack of personal vituperation. The club was veryfortunate in having guests why are outstanding in various fields of publising and writing. The talks, discussions, and criticisms of stories and plots by the guests are usually the most interesting part of the program. The club owes a debt of gratitude to Weisinger, Horning, Campbell, de Camp, Willey Ley, Otto Binder and John D Clark for their accurate and careful analyses of science-fiction in general --- these impromptu analyses were sincere and elightening -- what more could one ask? It would be a sad meeting that missed the face of Julius Schwarts -- the father time of science-fiction. Julie, your touch is needed and appreciated in the club. The criticism of Ruppert is very desirable -- the man who dislikes most of the stories he reads and still continues to read science-fiction. Ruppert, we congratulate you on your perseverance and hope that some day you will find the type of stories that pleases you most of the time. It is unfortunate that Louis Kuslan cannot attend every meeting but extend thanks for his occasional visit. The author suggests that the woman's auxillary read a little more science fiction so that they can take a greater part in the discussion. Their presence has lent a glamor that a club always needs to off-set the drabness of masculinity. The next year should see an increased enrollment of this section. 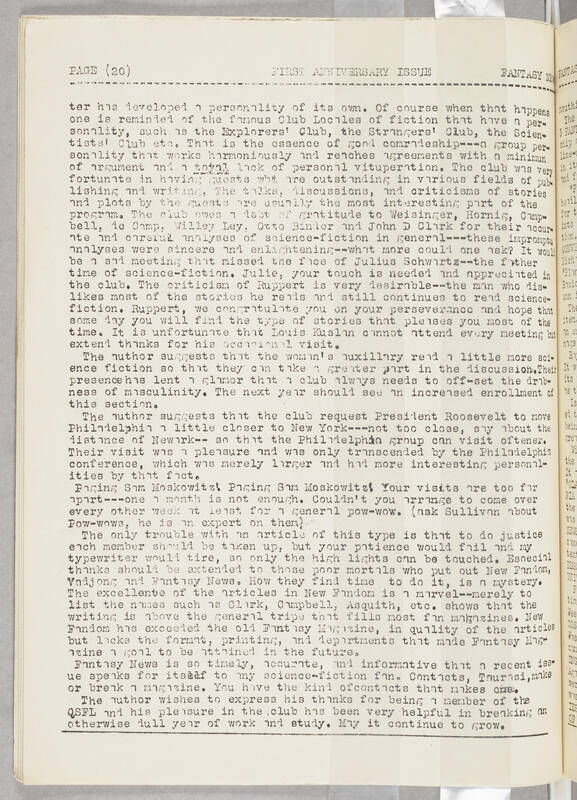 The author suggests that the club request President Roosevelt to move Philadelphia a little closer to New York --- not too close, say about the distance of Nework -- so that the Philadelphia group can visit oftener. Their visit was a pleasure and was only transcended by the Philadelphia conference, which was merely largar and had more interesting personalities by that fact. Paging Sam Moskowitz! Paging Sam Moskowitz! Your visits are too far apart --- one a month is not enough. Couldn't you arrange to come over every other week at least for a general pow-wow. (ask Sullivan about Pow-wows, he is an expert on them) The only trouble with an article of this type is that to do justice each member should be taken up, but your patience would fail and my typewriter would tire, so only the high lights can be touched. Especial thanks should be extended to those poor mortals who put out New Fandom, Vadjong and Fantasy News. How they find time to do it, is a mystery. The excellente of the articles in New Fandom is a marvel -- merely to list the names such as Clark, Campbell, Asquith, etc. shows that the writing is above the general tripe that fills most fan magazines. New Fandom has exceeded the old Fantasy Magazine, in quality of the articles but lacks the format, printing and departments that made Fantasy Magazine a goal to be attained in the future. Fantasy News is so timely, accurate, and informative that a recent issue speaks for itself to any science-fiction fan. Contacts, Taurasi, make or break a magazine. You have the kind of contacts that makes one. The author wishes to express his thanks for being a member of the QSFL and his pleasure in the club has been very helpful in breaking an otherwise dull year of work and study. May it continua to grow.